As of 5pm, four mushers have crossed the Yukon Quest finish line in Fairbanks, ending their 1,000-mile international sled dog race. Brent Sass is now a two-time Quest champion, arriving first into the finish chute at 12:40pm Monday. In Sass’ line were all 14 dogs with which he started the race. According to the leaderboard, Sass took nine days, two hours, and 34 minutes to complete the race from Whitehorse, Yukon Territories, to Fairbanks, Alaska. That time is more than 16 hours faster than Allen Moore’s winning run from last year’s Quest and ten hours faster than his own race time from 2015, the first year Sass won the Quest. Finishing about an hour and a half behind Sass was Hans Gatt, also a previous Quest champion. He arrived with eight dogs on the line. After Gatt came 2018 champ Allen Moore, who reached the finish at 3:30 this afternoon in third place. According to the GPS tracker, fourth-positioned Michelle Phillips reached Fairbanks just minutes before 5pm (AKST). And to round out the top five, two mushers are currently battling out along the 70 miles of trail between Two Rivers and the finish line. Matt Hall left the last checkpoint after 2:30pm this afternoon in fifth position, followed minutes later by Paige Drobny. The eight-hour fine will be tacked onto Stachnau’s total race time once he reaches Two Rivers. 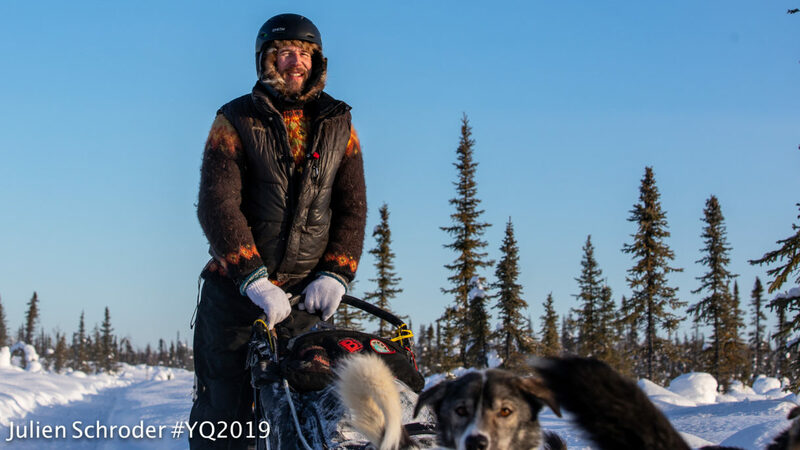 He is currently resting at Circle and is expected to be the final musher out of 27 to finish the 2019 Yukon Quest. Image at top: Brent Sass near the Yukon Quest checkpoint of Circle. Photo: Julien Schroder, Yukon Quest; used with permission.